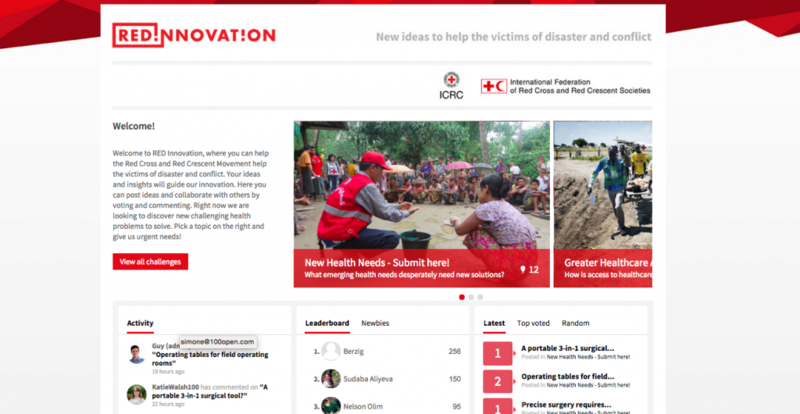 RED Innovation is the humanitarian crowdsourcing community that we manage for the International Committee of the Red Cross. This is a re-post of my most recent blog there. And also an invitation to you to join up if you want to contribute to helping the victims of violence. As we enter 2016 let’s look back and congratulate ourselves on what we achieved on RED Innovation in the first 9 months. First, some numbers! By December 2015 we had achieved a community of 633 people from 127 countries. Our community started with ICRC staff and has grown to include other parts of the movement, corporate partners, people from other humanitarian agencies and companies active in the sector. We discovered 86 ‘Needs’ in the first phase – important unsolved problems for the victims of disaster and conflict. After a summer workshop to choose our areas of focus, we asked for ideas on 8 different challenges. Ever creative, the community addressed these, submitting a total of 114 Ideas posts. Superbags: The need to make stronger and more cost-effective drop bags without sewing six layers over each one caught the attention of CERN, who chose the challenge to be hacked during THE Port Hackathon in October. Hotline in a box: In emergency situations, implementing hotlines takes time and needs multiple technologies and languages to reach all beneficiaries. The idea behind this prototype is to provide a free and open-source toolkit for the rapid deployment of hotline services. Off Grid Amazon: This pilot stems from the merger of the Re-energise and Light-in-dark-places challenges. ICRC is working with UN agencies, the CDAC Network and other humanitarian actors on a pilot programme to build a platform for off-the-grid energy solutions. Identity: The RED Innovation platform helped identify a technology that is of interest for the ICRC: the palm scan. This technology, developed by Fujitsu, scans the vein map of the hand, which is unique to each person. In addition, the Social Media Comms and Re-Connections challenges have respectively triggered internal discussions about developing a digital network of Movement volunteers, and pushed us to explore more efficient ways of providing connectivity for the purpose of restoring family links. ICRC is currently working on defining the prototypes for future testing. As well as answering specific needs, one other positive result of Red Innovation is the number of new useful contacts and relationships that have been formed, both across the movement and with other organisations. The platform has created conversations across the movement between Geneva and Rwanda, Burundi, Ethiopia, US, New Zealand, UK, Nepal, Liberia, Afghanistan and India and has raised awareness of issues such as urban violence and sexual violence against men. Not bad for the first 9 months! This year we aim grow our commnity and get from Need to Prototype even quicker and to repeat the process for new needs and challenges several times. We hope to have you with us!